CBNA FBLA Members at the State Convention: left to right Taylor Richardson, Cody Vaughn, Brittany Guillemette, Alex Yonchak, Maxim Begin, Nate Schroeder, Lauren Velleca, Meghan Percy, Nicole Beaupre, and advisor Dr. JoAnn Zylak. 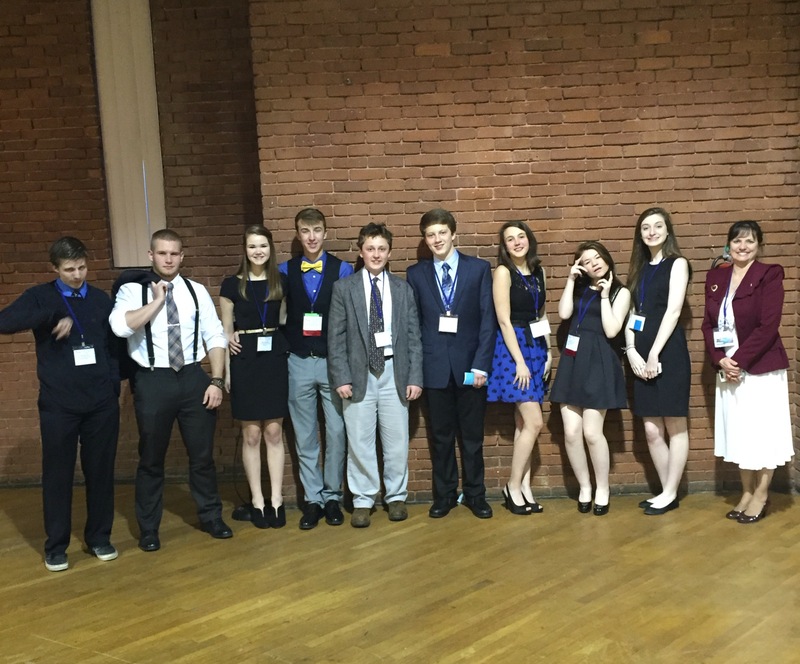 Coe-Brown Northwood Academy’s Future Business Leaders of America chapter participated in the FBLA State Leadership Conference which was held at the Radisson Hotel in Manchester on March 31 and April 1, 2015. Students competed in many business related areas and received several awards and recognitions. A Chapter Award for Who’s Who in FBLA went to junior Brittany Guillemette of Strafford for her work in Breast Cancer Awareness, and the whole chapter received an Honorary Chapter Award for the number of activities they have participated in throughout the year. The Marketing Team of Brittany Guillemette, junior Nicole Beaupre of Northwood and junior Meghan Percy of Barrington received a medal for third place, and each received a $1,000 scholarship to SNHU. Other awards included an honorable mention in Introduction to Communications for freshman Nate Schroeder, of Strafford. Taylor Richardson, a senior from Strafford placed third in the state in Business Procedures and Maxim Begin, a freshman from Northwood, placed third in Business Math. Others who attended and competed were senior Alex Yonchak from Strafford in Impromptu Speaking, senior Cody Vaughn from Northwood in Client Services, and senior Lauren Velleca from Northwood in Accounting. Every student who received an award is eligible to compete in Chicago, Illinois, at the National FBLA Convention in their respective areas later this year.